We are very proud to introduce Apartment Canella. One of our brand new furnished apartments for 2016. This is our ground floor, two bedroom property. The master bed includes a large double bed, fitted wardrobes and a patio door leading to the private patio. The smaller back bedroom includes a sofa type bed that splits into 2 singles, suitable for children and younger teenagers. The large open plan living room / kitchen area includes all the necessary home from home requirements. Covering over 60m2 this a very spacious property for 4 persons. The living area includes patio doors leading to the patio. The patio and garden enjoy sea views. The property has been decorated and furnished to a very high and tasteful standard. For Apartments Tangerine, Nectar, Magnolia & Anemone - Please Enter 1720558 Into The Search Box And Hit Enter! Onsite Manager throughout the summer season to assist our clients. Highly knowledgeable of local, surrounding areas and island in general. Twice a week housekeeping. Calm, traditional village by the sea. The apartment was kept to an extremely high standard with modern tv, fridge freezer, microwave, cooker and oven and washing machine. Fully air-conditioned. Harry in reception was full of knowledge and extremely helpful and friendly. 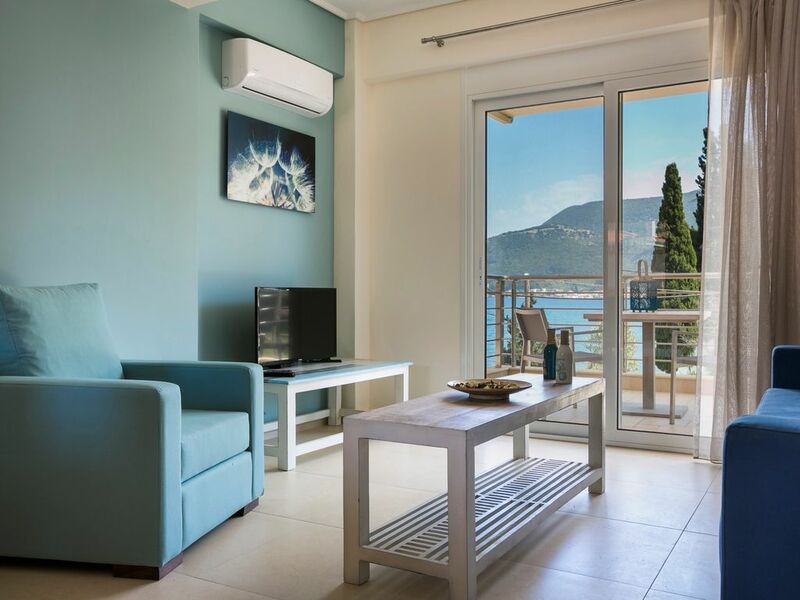 We had an amazing time and would recommend the Eucalyptus Apartments as a superb venue for those wanting a quiet and relaxing place to stay in Kefalonia. Absolutely Fantastic! A brilliant apartment. The communication throughout has been excellent. On arrival, we were met by Harry who is, without doubt, the best person to meet in a new country! His local knowledge, relaxed attitude and genuine desire to make our stay the best it could be, worked - we had a fantastic fortnight in Kefalonia. The apartment itself is excellent - very well equipped, close enough to Sami (a 25 minute walk, and on the bus route), has pool access, air conditioning (definitely needed!) and is certainly large enough for our family of four. The garden is an added bonus and gave us additional eating space. The apartment is cleaned every other day, and nothing seems too much trouble. Would definitely recommend - will look to book here the next time we visit Kefalonia. The apartment was lovely, modern and relaxing. Beautifully clean and cleaned a further twice during our week long stay. The location of the apartment is perfect. We toured much of the island in our hire car with no destination being further than around 45 minutes away and many being much closer. The sea outside of the apartments was quirky with its warm bottom and cold surface and provided a beautiful evening backdrop. Our favorite beach of the island, Antisamos is around a 5/10 minute drive with ample parking on arrival. Sami itself is a lovely port with many lovely and inexpensive places to eat. Harry, the host who lives on site is a hive of information about the island and very happy to impart his knowledge. His talk on the night we arrived was invaluable. The pool is small and quiet and well kept. In all our stay was perfect, and in all of our trips we did not see anywhere we wished we had stayed. We spent a week in Canella Apartment with our 16 year old daughter. The apartment was immaculate and well equipped. Reggina and Harry were easily found on site and were extremely helpful in aiding us to get the most out of our stay in Kefalonia. Nothing was too much trouble for them. The pool was clean and well maintained. The apartment was fantastically located for accessing other parts of the island and within walking distance of the restaurants (along a lovely walk by the sea). More than happy to recommend and will definitely be returning. Well managed, comfortable, well appointed apartment with a nice swimming pool. Friendly, efficient management. The apartment was clean and well equipped. Recommended! Sami is a gorgeous little town with a lovely atmosphere, close to Argostoli and airport, but removed from the hustle and bustle. Regina was very helpful and made some wonderful recommendations on places to eat and see.